Improving the sensitivity of light sensors or the efficiency of solar cells requires fine-tuning of light capturing. KAUST researchers have used complex geometry to develop tiny shell-shaped coverings that can increase the efficiency and speed of photodetectors. Many optical-cavity designs have been investigated to seek efficiencies of light: either by trapping the electromagnetic wave or by confining light to the active region of the device to increase absorption. Most employ simple micrometer- or nanometer-scale spheres in which the light propagates around in circles on the inside of the surface, known as a whispering gallery mode. Former KAUST scientist Der-Hsien Lien, now a postdoctoral researcher at the University of California, Berkeley, and his colleagues from China, Australia and the U.S. demonstrate that a more complex geometry comprising convex nanoscale shells improves the performance of photodetectors by increasing the speed at which they operate and enabling them to detect light from all directions. Surface effects play an important role in the operation of some devices, explains KAUST principal investigator, Jr-Hau He. Nanomaterials offer a way to improve performance because of their high surface-to-volume ratio. "However, although nanomaterials have greater sensitivity in light detection compared to the bulk, the light–matter interactions are weaker because they are thinner," describes He. "To improve this, we design structures for trapping light." 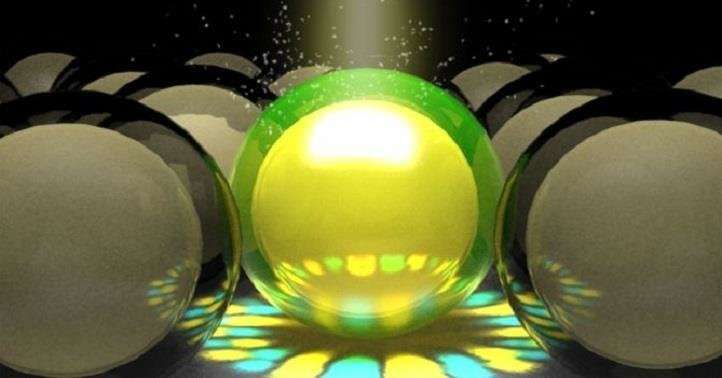 The researchers made their spherical multi-nanoshells from the semiconductor zinc oxide. They immersed solid carbon spheres into a zinc-oxide salt solution, coating them with the optical material. Heat treatment removed the carbon template and defined the geometry of the remaining zinc-oxide nanostructures, including the number of shells and the spacing between them. Thus Lien and colleagues were able to engineer the interaction between outer and inner shells to induce a whispering gallery mode and light absorption near the surface of the nanomaterial. The team incorporated their nanoshells into a photodetector. The symmetry of the spherical nanoshells meant that the whispering gallery mode could be excited with little dependence on the incident angle or the polarization of the incoming light. One problem encountered with previous photodetectors based on metal-oxide nanoparticles is their slow speed, with the devices taking as long as several hundred seconds to respond. Using zinc-oxide nanoshells, photodetectors were able to respond in 0.8 milliseconds. "This strategy can be applied to other work, such as solar cells and water-splitting devices," says He. "In the future, we will look at different material systems and design structures that also improve device performance in these other applications."